Spun around by the dizzying array of acrylic mediums that are available? 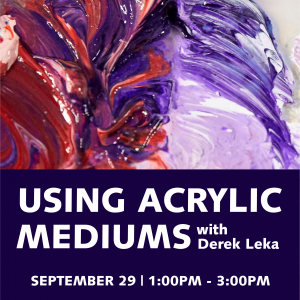 Artist Derek Leka will guide you through all of them, instructing in the capabilities of each acrylic medium and what they are best suited for. Experiment and find a new favorite! This workshop will feature products by Liquitex and take place at Hull’s Second Story Gallery + Workshop, upstairs from Hull’s Art Supply + Framing. To attend, a $10 deposit is required to secure your spot. It will be returned as a $15 store voucher. This workshop is a part of our FALL WORKSHOPS series, which run from September 15 thru October 27. Posted in Demos, Workshops + Shows, Second Story Gallery + Workshop.